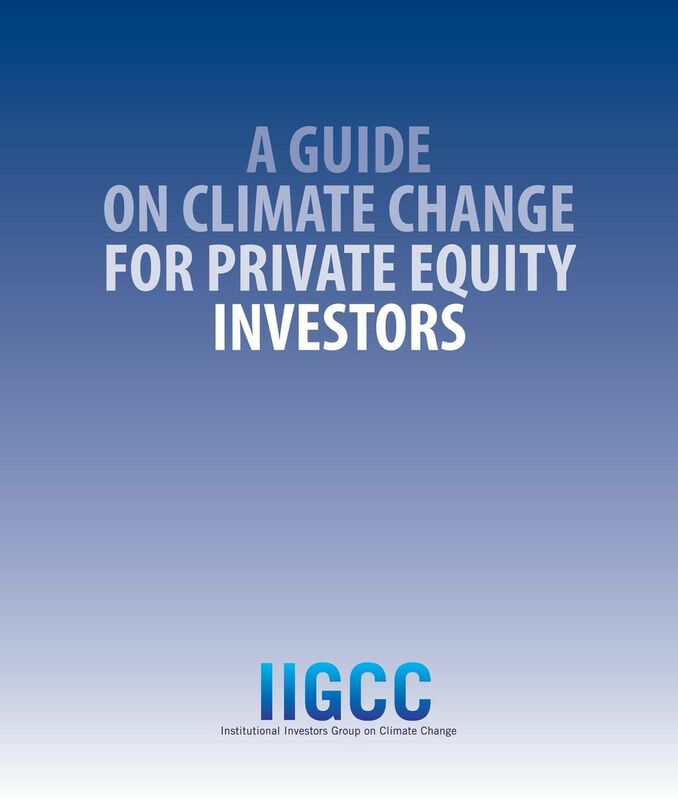 Download "A GUIDE ON CLIMATE CHANGE FOR PRIVATE EQUITY INVESTORS"
2 Contents Introduction and approach...1 Questions for investors and their advisors to ask their GPs...3 Questions for GPs to ask portfolio companies and potential new investee companies...6 Final thoughts...9 About IIGCC The Institutional Investors Group on Climate Change (IIGCC) is a forum for collaboration on climate change for European investors. The group s objective is to accelerate investment in a low-carbon economy by bringing investors together to use their collective influence with companies, policymakers and investors. The group currently has over 50 members, representing assets of around 4trillion. Acknowledgements IIGCC would like to acknowledge the contributions of Tom Murley, HgCapital, Aled Jones, LPFA, Peter Dunscombe, BBC Pension Trust Ltd, David Russell, USS, Patrick Sheehan, Environmental Technologies Fund, Tom Rotherham, UN PRI, Guy Paisner, Doughty Hanson, and Ludo Bammens, Kohlberg Kravis Roberts & Co. Ltd. IIGCC would also like to acknowledge the input of Andrew Graham of the British Venture Capital and Private Equity Association. 3 Introduction This guide is designed for pension fund trustees who are limited partners (LPs) in private equity funds and private equity fund managers, general partners (GPs), who are managing these funds. It aims to increase awareness of these investors of the risks, and opportunities, associated with climate change and related policy developments. It also seeks to provide guidance on how such factors might be considered by LPs when selecting their managers and by GPs when selecting investments. The report complements earlier IIGCC documents on the wider risks of climate change to the long term performance of pension fund investments. For many traditional private equity investments, such as in energy intensive industries, investment performance will be impacted by climate change and the policy responses taken to curb or adapt to it. Policies to mitigate climate change and new technologies to address these new challenges will provide business and investment opportunities for private equity funds. Furthermore, if climate change is likely to be a drag on economic growth, unless addressed, it will negatively affect the value of portfolios that invest in a cross section of assets, companies, sectors and markets. As such, considering the impact of climate change and seeking economic ways to improve the sustainability of investments by private equity managers is clearly consistent with the fiduciary duty of any long term investor. For trustees and private equity fund managers, it is therefore essential that they appreciate how climate change may affect companies that they invest in. They should begin to incorporate climate change as one element of their manager and investment selection and management processes. 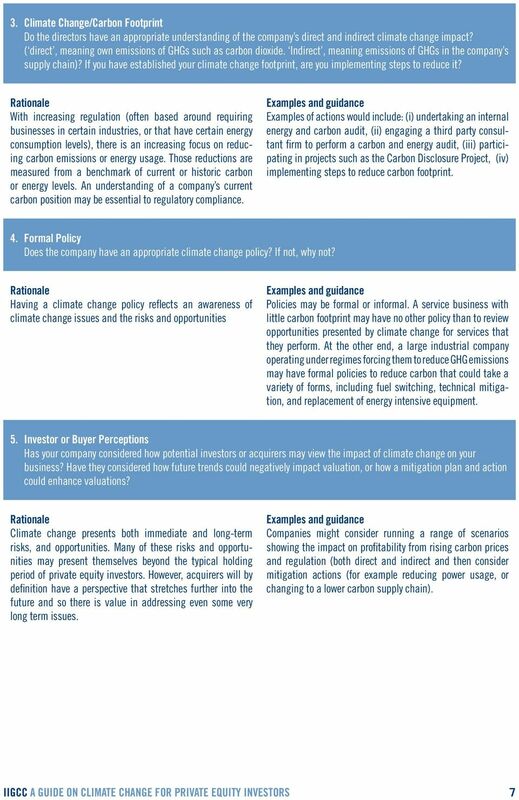 This note is provides guidance to LPs and their advisers and to GPs on the type of questions they should consider asking in order to understand the potential impact of both climate change and the cost of carbon on their investments and aims to support them in framing and managing the risks and opportunities from climate change. As a result of the breadth of private equity from backing small companies developing new technologies to buyouts of multinational conglomerates covering multiple geographies and sectors - we have provided guidance that focuses on general themes that trustees and GPs should consider across their portfolios rather than specifics. Clearly, the impact of climate change and climate change regulation will differ from early stage venture capital firms to those that focus on, e.g., retail or business services to those that focus on energy or energy intensive businesses or industrial manufacturing. However, we hope that the approach we have taken means that the guidance can be applied across the private equity spectrum and the range of investments where appropriate. 4 Approach This guide is set out as a series of questions, with a rationale and some practical examples alongside them. There are two sections the first includes questions that LPs and their advisers should ask their existing or potential GPs and the second section contains questions that GPs should ask of the management of their portfolio companies and target investments. 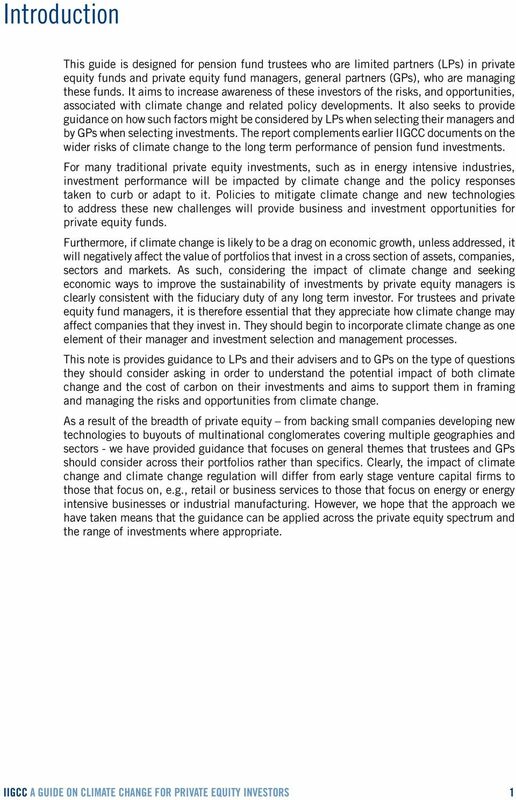 Broadly, the questions cover four key aspects of climate change and private equity investment:.... Awareness Are GPs and their portfolio companies aware of climate change issues, regulations and trends? 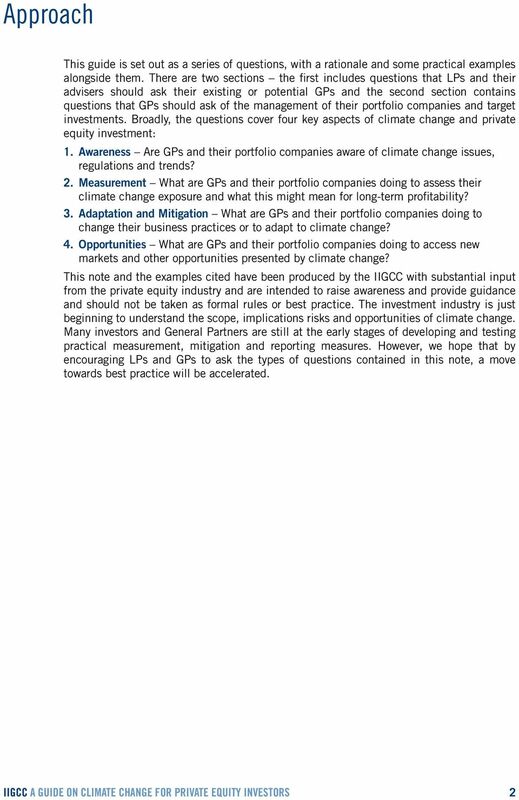 Measurement What are GPs and their portfolio companies doing to assess their climate change exposure and what this might mean for long-term profitability? Adaptation and Mitigation What are GPs and their portfolio companies doing to change their business practices or to adapt to climate change? Opportunities What are GPs and their portfolio companies doing to access new markets and other opportunities presented by climate change? 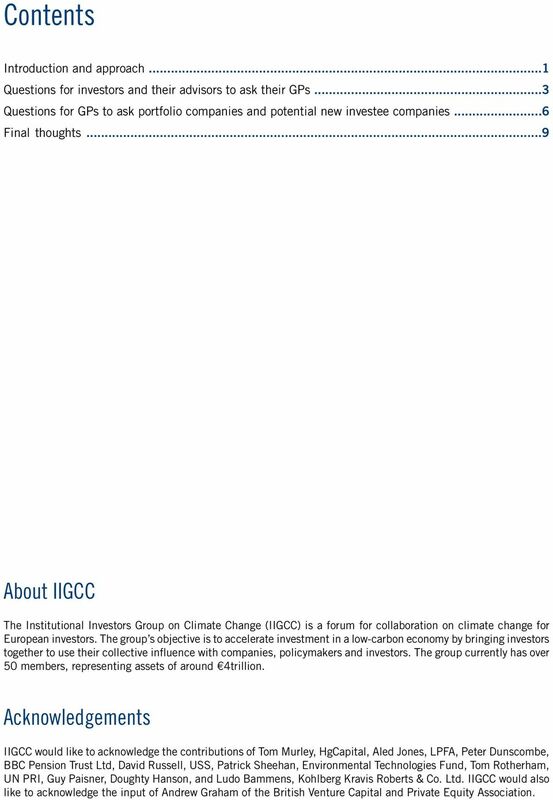 This note and the examples cited have been produced by the IIGCC with substantial input from the private equity industry and are intended to raise awareness and provide guidance and should not be taken as formal rules or best practice. The investment industry is just beginning to understand the scope, implications risks and opportunities of climate change. Many investors and General Partners are still at the early stages of developing and testing practical measurement, mitigation and reporting measures. However, we hope that by encouraging LPs and GPs to ask the types of questions contained in this note, a move towards best practice will be accelerated. 5 Questions for investors and their advisors to ask general partners 1. Climate Change Risk Assessment Do you assess the impact (or potential impact) of climate change on existing and new investments? If so how? How is this integrated into your new investment and portfolio management processes? Climate change (and by extension mitigating regulation) presents many varied risks. These risks differ from industry to industry, and may affect costs, profitability and longterm viability. Increasingly limited Partners (LPs) should understand what actions their general partners (GPs) are taking to integrate climate change risk assessment and impacts in their investment decision-making and investment management processes, or if not fully implemented, what steps they are taking to start to integrate such analysis. Climate change risk assessment should be an on-going process. It should be addressed during early investment decision-making; at detailed due diligence; during ownership and in consideration of exit strategy. Risks that businesses may assess include: (i) increased operating costs from having to reduce emissions or purchase CO 2 offset certificates (or increased costs from suppliers who must do the same), (ii) inability to secure flood insurance, or only at higher cost, for facilities exposed to coastal flooding, (iii) the need to source agricultural products from new areas as a result of extended drought, (iv) rising legal and compliance costs. As in any emerging area, there will be wide variation in what GPs are doing to incorporate climate change in their processes. Examples of possible actions are: (i) including climate change assessment as part of standard due diligence checklists and processes, (ii) including relevant climate change issues in portfolio company business planning and legal reviews. Some GPs may have internal expertise, but more often might include the use of external advisors. 2. 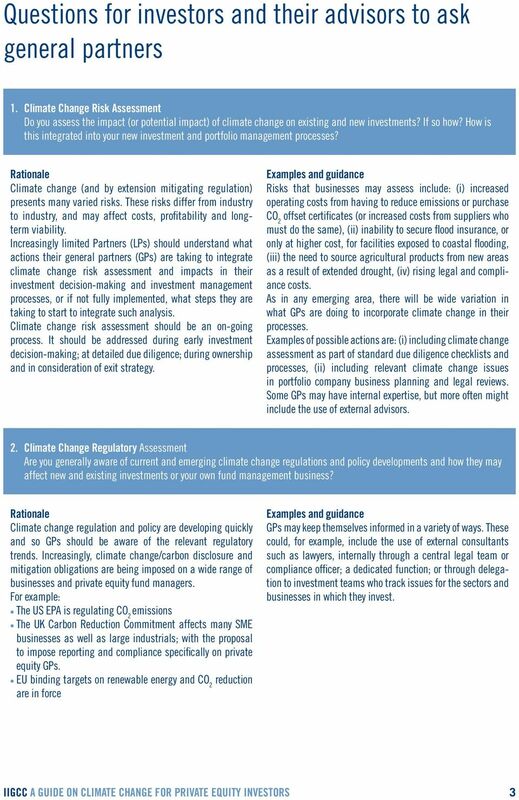 Climate Change Regulatory Assessment Are you generally aware of current and emerging climate change regulations and policy developments and how they may affect new and existing investments or your own fund management business? Climate change regulation and policy are developing quickly and so GPs should be aware of the relevant regulatory trends. 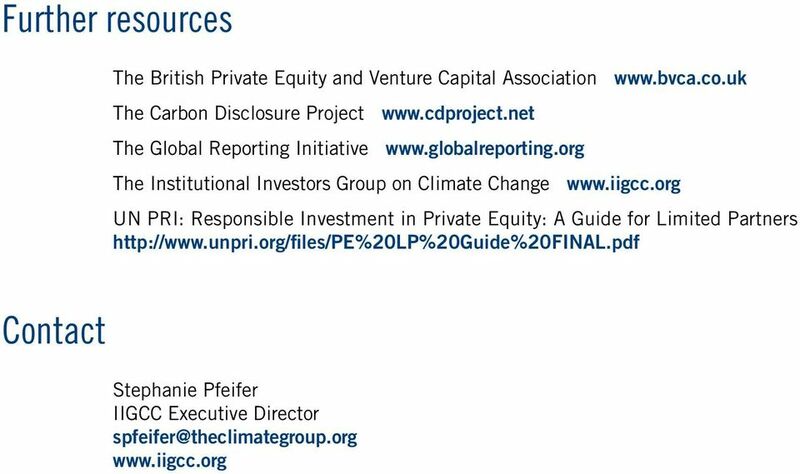 Increasingly, climate change/carbon disclosure and mitigation obligations are being imposed on a wide range of businesses and private equity fund managers. For example: The US EPA is regulating CO 2 emissions The UK Carbon Reduction Commitment affects many SME businesses as well as large industrials; with the proposal to impose reporting and compliance specifically on private equity GPs. EU binding targets on renewable energy and CO 2 reduction are in force GPs may keep themselves informed in a variety of ways. These could, for example, include the use of external consultants such as lawyers, internally through a central legal team or compliance officer; a dedicated function; or through delegation to investment teams who track issues for the sectors and businesses in which they invest. 6 3. Climate Change Risk Management In your individual portfolio companies, how are climate-related issues managed? (For example, issues such as the price of carbon, emissions reduction requirements, as well as potential opportunities.) Ultimately, climate-related risks and opportunities have to be managed. While good management comes in many forms, it is normally clearly discernable and should be able to be commented upon to LPs. Examples could include: (i) initial carbon footprint assessments and annual updates of carbon emissions, (ii) including carbon and climate change compliance costs in annual and long-term budget forecasts, (iii) specific reporting standards included in the regular reports issued by portfolio companies to GPs, (iv) establishing monitoring on key performance indicators (KPIs) for climate issues. Similarly in strategic planning, examples could include the use of scenario planning of opportunities and threats resulting from climate change and associated regulation. 4. Climate Change Monitoring & Reporting At the portfolio level, how do you monitor and report climate-related issues? Transparent, regular monitoring will help in the assessment of portfolio-wide and systemic risks. Similarly appropriate reporting to LPs will allow them assess climate risks in their own portfolios and assist in asset allocation. This is clearly an emerging area. Older portfolios may have been assembled in a less risky climate change environment. Whilst some GPs review and track at a portfolio level, most will not have done so. As individual company data is assembled, GPs should be open to aggregating that data and developing methodologies to assess portfolio risk. At present there are no agreed standards or methods for reporting, and different investors may seek different information. However, as this is an emerging area of concern for investors, they may, for example, be satisfied with basic details on how GPs are addressing the range of issues, highlighting the challenges of doing so and setting out medium term objectives for improving reporting. Using reporting formats like the Carbon Disclosure Project can be a good start. 5. 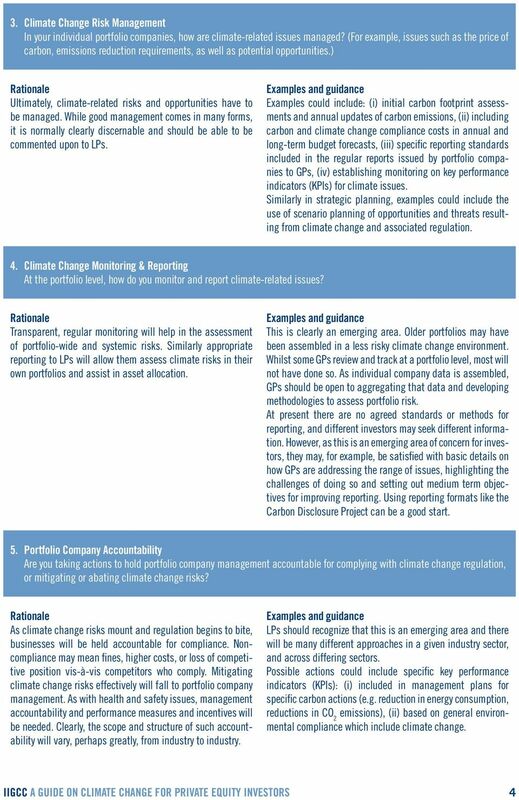 Portfolio Company Accountability Are you taking actions to hold portfolio company management accountable for complying with climate change regulation, or mitigating or abating climate change risks? As climate change risks mount and regulation begins to bite, businesses will be held accountable for compliance. Noncompliance may mean fines, higher costs, or loss of competitive position vis-à-vis competitors who comply. Mitigating climate change risks effectively will fall to portfolio company management. As with health and safety issues, management accountability and performance measures and incentives will be needed. Clearly, the scope and structure of such accountability will vary, perhaps greatly, from industry to industry. LPs should recognize that this is an emerging area and there will be many different approaches in a given industry sector, and across differing sectors. Possible actions could include specific key performance indicators (KPIs): (i) included in management plans for specific carbon actions (e.g. reduction in energy consumption, reductions in CO 2 emissions), (ii) based on general environmental compliance which include climate change. 7 6. Positive Engagement Are you actively engaged in within the private equity industry, or through other organisations, in seeking to understand and address climate change and evaluate its potential risk to investments and opportunities for new investments? There are many organisations that are addressing climate change risks and opportunities, and seeking to raise investor awareness and understanding. By participating in these organizations, GPs may gain greater insight into risks and opportunities which could result in better investment decision making. It also provides opportunities for learning though shared experiences. GPs might, for example, (i) participate directly with governments or IIGCC and similar organisations, (ii) participate indirectly through organizations like the BVCA and EVCA that are engaging on climate related issues affecting the PE industry. As to new investment opportunities, this may also be done through direct GP research. 7. 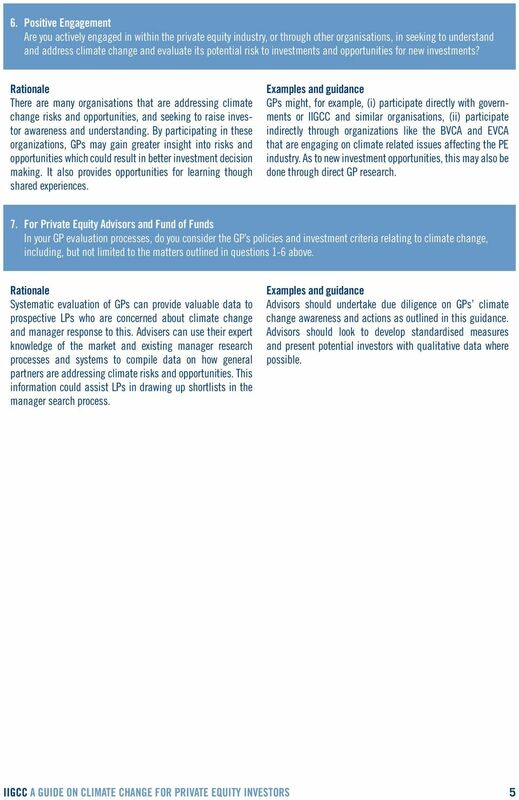 For Private Equity Advisors and Fund of Funds In your GP evaluation processes, do you consider the GP s policies and investment criteria relating to climate change, including, but not limited to the matters outlined in questions 1-6 above. Systematic evaluation of GPs can provide valuable data to prospective LPs who are concerned about climate change and manager response to this. Advisers can use their expert knowledge of the market and existing manager research processes and systems to compile data on how general partners are addressing climate risks and opportunities. This information could assist LPs in drawing up shortlists in the manager search process. Advisors should undertake due diligence on GPs climate change awareness and actions as outlined in this guidance. Advisors should look to develop standardised measures and present potential investors with qualitative data where possible. 8 Questions for general partners to ask portfolio companies and potential new investee companies 1. Regulatory Awareness Are the directors aware of current and proposed laws and regulations relating to climate change, including CO 2 reduction and reporting? How do they keep themselves informed? Does, or should, the company have an officer or employee responsible for climate change or environmental measurement and reporting? Climate change regulation and policy is increasing. It is having, and will continue to have a material impact on businesses and the way they operate. Directors should be aware of the current and emerging regulatory trends. There are an increasing number of climate change related regulations, which impose both mitigation and/or reporting obligations on business. There are many more proposed laws and regulations at the international, national and local levels. For example: The US EPA is regulating CO 2 emissions The UK Carbon Reduction Commitment affects many SME businesses as well as large industrials EU large combustion plant directive EU renewable energy and CO 2 reduction targets There are also government programmes to help companies understand climate change and carbon mitigation, such as programmes run by the Carbon Trust in the UK. In some countries grants are available for carbon abatement. Directors might keep themselves informed in a variety of ways. These could include regular use of external consultants such as lawyers, internally through a central legal or compliance officer or team, or a dedicated function. 2. 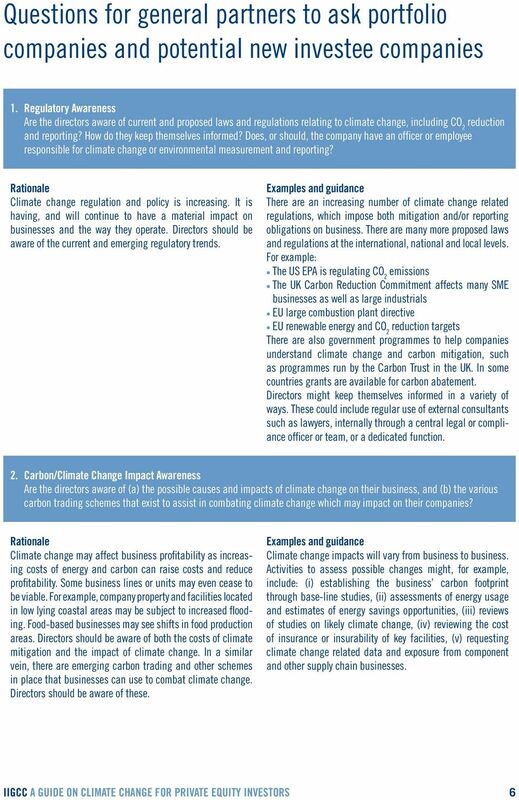 Carbon/Climate Change Impact Awareness Are the directors aware of (a) the possible causes and impacts of climate change on their business, and (b) the various carbon trading schemes that exist to assist in combating climate change which may impact on their companies? Climate change may affect business profitability as increasing costs of energy and carbon can raise costs and reduce profitability. Some business lines or units may even cease to be viable. For example, company property and facilities located in low lying coastal areas may be subject to increased flooding. Food-based businesses may see shifts in food production areas. Directors should be aware of both the costs of climate mitigation and the impact of climate change. In a similar vein, there are emerging carbon trading and other schemes in place that businesses can use to combat climate change. Directors should be aware of these. Climate change impacts will vary from business to business. Activities to assess possible changes might, for example, include: (i) establishing the business carbon footprint through base-line studies, (ii) assessments of energy usage and estimates of energy savings opportunities, (iii) reviews of studies on likely climate change, (iv) reviewing the cost of insurance or insurability of key facilities, (v) requesting climate change related data and exposure from component and other supply chain businesses. 9 3. Climate Change/Carbon Footprint Do the directors have an appropriate understanding of the company s direct and indirect climate change impact? ( direct, meaning own emissions of GHGs such as carbon dioxide. Indirect, meaning emissions of GHGs in the company s supply chain)? If you have established your climate change footprint, are you implementing steps to reduce it? With increasing regulation (often based around requiring businesses in certain industries, or that have certain energy consumption levels), there is an increasing focus on reducing carbon emissions or energy usage. Those reductions are measured from a benchmark of current or historic carbon or energy levels. An understanding of a company s current carbon position may be essential to regulatory compliance. Examples of actions would include: (i) undertaking an internal energy and carbon audit, (ii) engaging a third party consultant firm to perform a carbon and energy audit, (iii) participating in projects such as the Carbon Disclosure Project, (iv) implementing steps to reduce carbon footprint. 4. Formal Policy Does the company have an appropriate climate change policy? If not, why not? Having a climate change policy reflects an awareness of climate change issues and the risks and opportunities Policies may be formal or informal. A service business with little carbon footprint may have no other policy than to review opportunities presented by climate change for services that they perform. At the other end, a large industrial company operating under regimes forcing them to reduce GHG emissions may have formal policies to reduce carbon that could take a variety of forms, including fuel switching, technical mitigation, and replacement of energy intensive equipment. 5. Investor or Buyer Perceptions Has your company considered how potential investors or acquirers may view the impact of climate change on your business? Have they considered how future trends could negatively impact valuation, or how a mitigation plan and action could enhance valuations? Climate change presents both immediate and long-term risks, and opportunities. Many of these risks and opportunities may present themselves beyond the typical holding period of private equity investors. However, acquirers will by definition have a perspective that stretches further into the future and so there is value in addressing even some very long term issues. 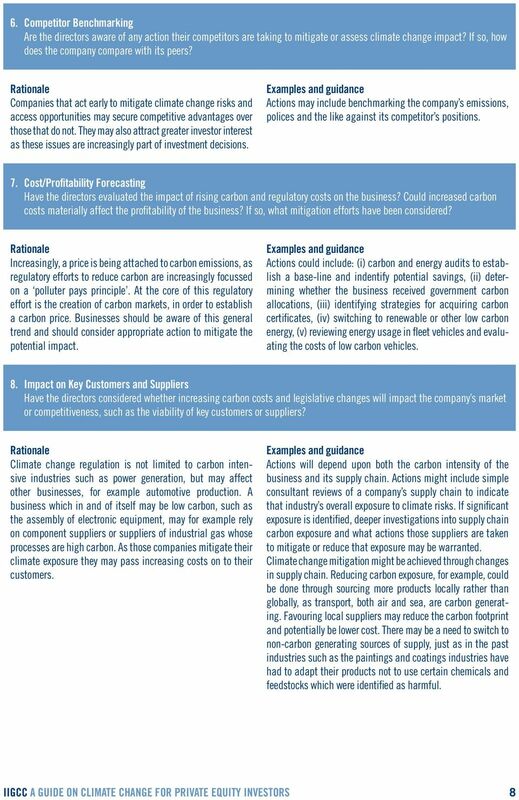 Companies might consider running a range of scenarios showing the impact on profitability from rising carbon prices and regulation (both direct and indirect and then consider mitigation actions (for example reducing power usage, or changing to a lower carbon supply chain). 10 6. Competitor Benchmarking Are the directors aware of any action their competitors are taking to mitigate or assess climate change impact? If so, how does the company compare with its peers? Companies that act early to mitigate climate change risks and access opportunities may secure competitive advantages over those that do not. They may also attract greater investor interest as these issues are increasingly part of investment decisions. Actions may include benchmarking the company s emissions, polices and the like against its competitor s positions. 7. Cost/Profitability Forecasting Have the directors evaluated the impact of rising carbon and regulatory costs on the business? Could increased carbon costs materially affect the profitability of the business? If so, what mitigation efforts have been considered? Increasingly, a price is being attached to carbon emissions, as regulatory efforts to reduce carbon are increasingly focussed on a polluter pays principle. At the core of this regulatory effort is the creation of carbon markets, in order to establish a carbon price. Businesses should be aware of this general trend and should consider appropriate action to mitigate the potential impact. Actions could include: (i) carbon and energy audits to establish a base-line and indentify potential savings, (ii) determining whether the business received government carbon allocations, (iii) identifying strategies for acquiring carbon certificates, (iv) switching to renewable or other low carbon energy, (v) reviewing energy usage in fleet vehicles and evaluating the costs of low carbon vehicles. 8. Impact on Key Customers and Suppliers Have the directors considered whether increasing carbon costs and legislative changes will impact the company s market or competitiveness, such as the viability of key customers or suppliers? Climate change regulation is not limited to carbon intensive industries such as power generation, but may affect other businesses, for example automotive production. A business which in and of itself may be low carbon, such as the assembly of electronic equipment, may for example rely on component suppliers or suppliers of industrial gas whose processes are high carbon. As those companies mitigate their climate exposure they may pass increasing costs on to their customers. Actions will depend upon both the carbon intensity of the business and its supply chain. Actions might include simple consultant reviews of a company s supply chain to indicate that industry s overall exposure to climate risks. If significant exposure is identified, deeper investigations into supply chain carbon exposure and what actions those suppliers are taken to mitigate or reduce that exposure may be warranted. Climate change mitigation might be achieved through changes in supply chain. Reducing carbon exposure, for example, could be done through sourcing more products locally rather than globally, as transport, both air and sea, are carbon generating. Favouring local suppliers may reduce the carbon footprint and potentially be lower cost. There may be a need to switch to non-carbon generating sources of supply, just as in the past industries such as the paintings and coatings industries have had to adapt their products not to use certain chemicals and feedstocks which were identified as harmful. 11 9. Access to key resources Will changes in natural systems affect access to resources (such as water) or to markets? Climate change will impact natural systems. Agricultural growth rates or lands may change. More frequent droughts or flooding could lead to crop failures. These could adversely affect food and other agricultural businesses. Access to resources may be disrupted. Such changes could affect profitability and supply or raw materials. Actions could include a review of the company s supply chain and developing contingency plans in case of supply disruptions. 10. 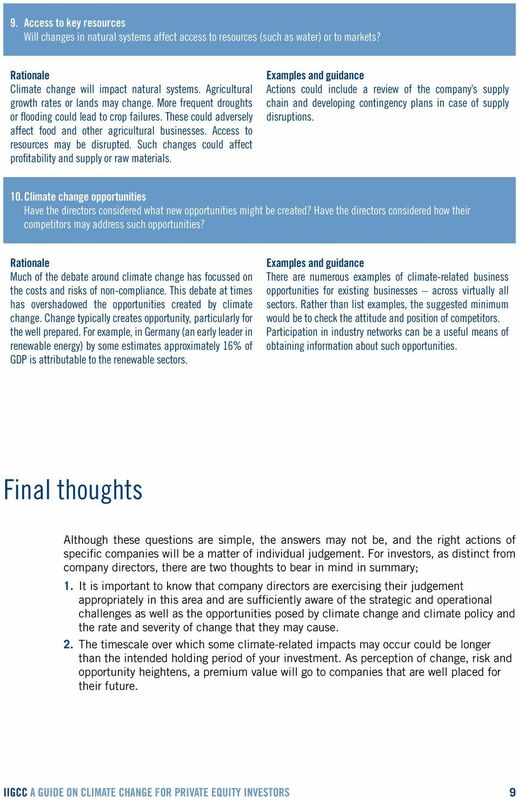 Climate change opportunities Have the directors considered what new opportunities might be created? Have the directors considered how their competitors may address such opportunities? Much of the debate around climate change has focussed on the costs and risks of non-compliance. This debate at times has overshadowed the opportunities created by climate change. Change typically creates opportunity, particularly for the well prepared. For example, in Germany (an early leader in renewable energy) by some estimates approximately 16% of GDP is attributable to the renewable sectors. There are numerous examples of climate-related business opportunities for existing businesses across virtually all sectors. Rather than list examples, the suggested minimum would be to check the attitude and position of competitors. Participation in industry networks can be a useful means of obtaining information about such opportunities. Final thoughts Although these questions are simple, the answers may not be, and the right actions of specific companies will be a matter of individual judgement. For investors, as distinct from company directors, there are two thoughts to bear in mind in summary;.. It is important to know that company directors are exercising their judgement appropriately in this area and are sufficiently aware of the strategic and operational challenges as well as the opportunities posed by climate change and climate policy and the rate and severity of change that they may cause. The timescale over which some climate-related impacts may occur could be longer than the intended holding period of your investment. As perception of change, risk and opportunity heightens, a premium value will go to companies that are well placed for their future. Get sustainability reporting right for your business. White Certificates Trading, Green Certificates Trading, Emission Trading Which One to Choose? Equality and Human Rights Commission Business and human rights: A five-step guide for company boards 2 About this publication What is the aim of this publication? This guide is for boards of UK companies. University of Warwick Risk Initiative Briefing Managing Risk and Innovation: the Challenge for Smaller Businesses Successful innovation is in large measure an issue of identifying and controlling risk. EU energy and climate policies beyond 2020 Policy recommendations EU s energy and climate change policies are in need of reform. They need to be consistent, simplified and set to drive European competitiveness. Fiduciary Management. What is Fiduciary Management?